Anodised Aluminium Plates / Tags are 1.2mm thick and come with or with out adhesive on the back. They are available in a vast range of colours and sizes, laser etched with your required information or logo. 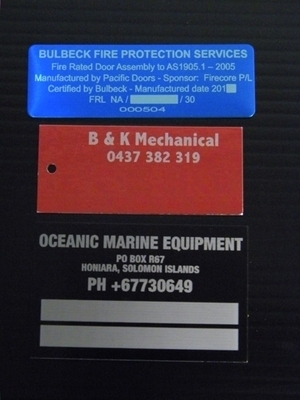 Anodised Aluminium is generally used as Compliance Plates or I.D.Tags, however can be used in may different ways.